Kremling Kamp is a level in the Aqua World area of DK: King of Swing. Set in a large cave, it is one of the four levels that must be completed to access the world's boss level, Davy Bones' Locker. As the level's name suggests, many Kremlings are in this level, specifically Kritters, who swing on pegs and peg boards that Donkey Kong (or Diddy Kong in Diddy mode) need to use to progress. 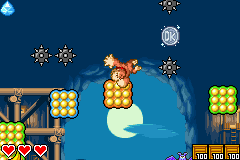 Flipflaps also appear in the later parts of the level. Many obstacles appear in this level, including tires, crates, barrels, rocks that can be thrown, and Floating Mines. The blue and white pegs from Lockjaw Falls that can swing Donkey Kong high into the air (if he holds onto them with the correct hand) return here as well, but only in a Bonus Level. The level begins on a wooden platform with some pegs above it. A gap with a wall of tires floating in it blocks the primate's path, so he must climb over them with the pegs. The first five pegs have bananas on them, and barrels stand higher up. They block the Kong's path, forcing him to break them in order to progress. When he reaches the top set of pegs, a Kritter can be found to the right swinging on a lone peg. A pathway of pegs leading downwards along the other side of the tires is next to the foe, with barrels all the way down it. The Kong must travel downwards while getting past the barrels to reach a set of pegs that lead to an upward pathway of rectangular peg boards. A single peg moves along the side of the peg boards with a Kritter on it, and bananas cover the boards as well. As the primate climbs the area of peg boards, barrels block his way. Eventually, though, a Kong can get onto a solid platform at the top of the area. Peg boards are placed above it with four barrels on them. A Kritter spinning on a peg is farther to the left of him. The peg can be used to reach a small platform nearby with a Bonus Barrel on it. 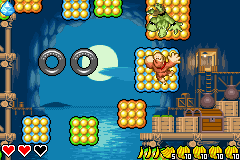 The barrel leads into a Bonus Level, where the Kong must swing on rotating, blue and white pegs, which can throw him high into the air, to collect many bananas located in the air. Once they are all collected, a Crystal Coconut appears at the top of the area on a small platform. Outside of the Bonus Level, there is also a small platform that leads to the second section of the level. In this section, rocks must be used to break barrels and alter surroundings. The first rock is located under two pegs. A peg with three bananas around it is above, while a barrel floats nearby. If this barrel is broken, a trio of peg boards appear below, creating a path to travel on to reach a group of five pegs. If the barrel placed above them is destroyed, a peg board and a pair of pegs appear next to a nearby rock, which can be thrown at a barrel above it to make more peg boards appear to the west. A Kritter on some pegs is below the barrel that can be defeated for a Banana Bunch. Using the previously mentioned peg boards, the hero can climb near the top of the area, where there is another stone near a few pegs. It can be used to break a barrel to the right that is surrounded by mines. When it is hit, peg boards appear above the mines that can be utilized to climb to a platform that leads to the third area. Donkey Kong approaches the silver medal. Here, there are many moving peg boards of all sizes scattered all around the area. The first few rows of them have tires above them, making it harder to reach the above peg boards. A pathway of peg boards are at the end of the rows that lead up to the second set of rows. A Kritter swings on a peg boards on the way up. Flipflaps also fly around the area. After the Kong swings to the west on the next row of peg boards, he can find a second path of peg boards leading upwards and another Kritter on one of them. They lead up to some smaller peg boards that have mines surrounding them. The first pair of mines float above a small, blue board of pegs, and two others are placed parallel to each other in a vertical angle. A silver medal stands between the two mines. One last small peg board is after the mines, being followed by a platform with the exit sign on it. The level is complete when the primate lands on the platform by the sign. This page was last edited on April 5, 2019, at 12:48.